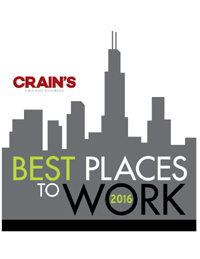 CHICAGO, April 20, 2016—Duane Morris LLP is pleased to announce that the firm has been named a 2016 “Best Place to Work for Women Over 35” by Crain’s Chicago Business. Duane Morris was selected for, among other reasons, its formal mentoring program, flexible work arrangements and health reimbursements. This year, 108 Chicago-area companies were doubly surveyed, with a total of more than 13,100 local employees. The employer survey focused on quantitative issues concerning compensation, promotions, healthcare and other benefits, and hiring practices. The employee survey dealt with fairness of compensation, vacation time, relationships with management and co-workers, career development, culture and other day-to-day workplace issues. The surveys were administered by Buck Consultants. Duane Morris has received many other related accolades, including inclusion on the Yale Law Women’s 2015 Top Ten Family Friendly Firms and on the 50 Best Law Firms for Women list by Working Mother magazine and Flex-Time Lawyers, which was based on the firm’s family-friendly policies and business development initiatives. The firm is included on The American Lawyer’s Women Partner Watch Honor Roll, and in 2014, the publication recognized Duane Morris as one of only 20 law firms among the Am Law 200 whose new partner classes were at least 30-percent women in each of the past three years. In addition, for the fifth year in a row, Duane Morris has been cited on the Honor Roll of Legal Organizations Welcoming Women Professionals by the Pennsylvania Bar Association Commission on Women in the Profession. Other Duane Morris offices have been recognized in recent years for being among the best places to work. Philly.com, the website affiliated with The Philadelphia Inquirer and Philadelphia Daily News, named the Philadelphia office as a 2016 “Top Workplace” in the Large Companies category. The firm’s Cherry Hill and Newark, N.J. offices were named Best Places to Work in New Jersey by NJBIZ in 2012 and 2013. Crain’s Chicago Business previously recognized the firm’s Chicago office as a Best Place to Work in 2010. The Duane Morris Women’s Impact Network for Success is devoted to the success of our women attorneys within the firm and in the industry. Through various programs, we exchange ideas, foster and expand business contacts and opportunities, and enhance attorney development to fully realize the talent, knowledge and potential of our women attorneys. Duane Morris’ Chicago office offers a breadth of services to clients throughout the United States and internationally. Attorneys in Chicago work closely with their colleagues in the firm’s other offices nationally and internationally in a wide range of areas, such as complex litigation and alternative dispute resolution; white-collar criminal litigation; corporate securities, mergers and acquisitions; complex financial transactions, banking and financial services; financial markets; private equity and venture capital; business reorganization and financial restructuring; health law; insurance and reinsurance; products liability; toxic torts and public safety; energy, environment and resources; international trade; intellectual property; employment and immigration law; real estate; information technology and telecommunications; and construction.